On June 15, 2015, our dear friend and colleague, Anastasia Lyalenko, passed away at the age of 22, from complications related to viral myocarditis. Her passing was sudden, and her presence deeply missed. Anastasia was the first research member of the DARPA Restoring Active Memory project, and we continue to make use of the data she collected and the lessons she brought back to us from the various hospitals in which she worked, tirelessly collecting data and spending appreciated time with patients awaiting surgery in the epilepsy monitoring units. We value the time we were able to spend with this bright and talented young woman, who touched so many lives within our lab, at the many sites across the country with which she worked, and in the EMU and OR with the patients and staff who so enjoyed and trusted her. We are deeply saddened by her loss--our loss--and wish, through this Memorial Fund, to commemorate her illustrative light, which went out far too soon. 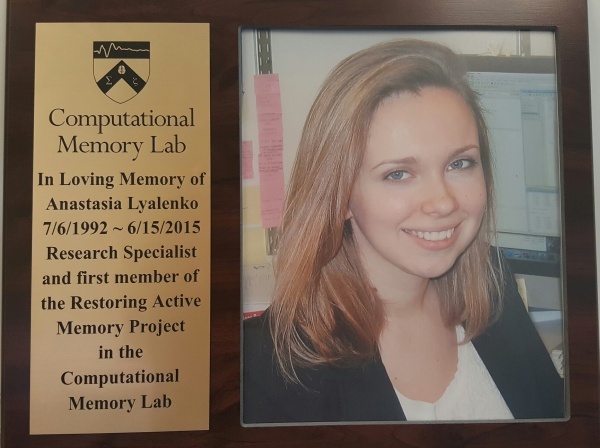 Anastasia planned to go to medical school following her research experience with the Computational Memory Lab, and we wish to join her family and friends in continuing her legacy and her wish. In honor of Anastasia, a Memorial Fund has been started to commemorate the work to which she planned to dedicate her life, and to help other women who wish to pursue a career in medicine. Please visit the Anastasia Lyalenko Memorial Page to donate. This page was last modified on 6 October 2015, at 18:03.